When doing fall yardwork, leaving moved leaves on top of your grass can be beneficial unless the leaves are from infected aspens, in which case, the diseases could spread from the leaves to other plants in the area. If you mow your leaves and leave them on top of the lawn, you will save yourself time and back-breaking work raking, bagging and pulling heavy bags out to the curb. You will also help to cut down the 8 million tons of leaves that end up in landfills nationwide each autumn. In landfills, leaves create methane gas that heightens global warming. On your lawn, mulched leaves create reduced fertilizer needs and help maintain soil moisture. Sweep or rake leaves from paved surfaces onto the lawn. Raise mower height as high as possible. Make a couple passes over the lawn to ensure good mulching and mow weekly, as needed, until leaves have stopped falling. Use mulched leaves to provide organic matter in other areas of the yard. Place them around trees, perennials, shrubs and in the veggie garden. Have any of your deciduous trees suffered recently from insects, fungi or any other diseases? These issues often appear in the leaves of your trees and can return to the soil if infected leaves are left to decompose in the yard. Aspens are susceptible to insects and diseases year after year. If your aspens have been struggling due to these causes within the last year, consider removing fallen aspen leaves from your yard entirely. Consider the following: Did your aspen leaves have any bugs this summer? Did your aspen leaves show signs of bumps, galls or black spots? If so, remove these infected leaves before mowing. 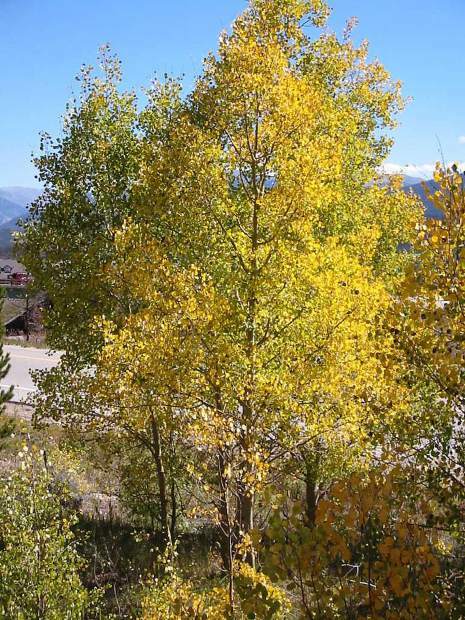 By taking a few extra minutes determining the overall health of your tree leaves, and keeping decomposing leaves away from your aspens, you can both cut down on landfill waste and protect the health of your aspen trees for years to come. Becky Garber is Director of the Associated Landscape Contractors of Colorado, of which Neils Lunceford is a member. Neils Lunceford Inc. can be reached at 970-468-0340 and at https://www.neilslunceford.com.